My guess is that we’ll see a lot of cheap, rubberized bumpers from the likes of Griffin, Speck, Belkin, and others. The case features a lightweight, microfiber construction, corner stabilizers, cut-outs around the case for access to key ports and buttons, and — most strikingly — a front flap to protect the iPad’s screen, which also doubles as a kick stand. Interestingly enough, we’ve seen several of Apple’s key iPad case features showing up across the entire spectrum of iPad case designs. For example, Incipio’s IPAD-133 Kickstand Nylon Case bears a remarkably similar set of features: its lightweight nylon design and cover flap/kickstand key on the same features that Apple has established in its own design. You cannot really claim any measure of creativity or uniqueness on the part of Incipio’s “incipid” iPad case. microfiber. CaseCrown’s leather iPad case adds several business-ready pockets to the inside flap, but all in all it offers the same basic design as Apple’s own iPad case. The same can be said for Simplism’s “simplistic” TR-LCFLIPAD-DR/EN Leather Flip iPad Case, though its slimmer profile gives the case more of a “folio” profile than the Apple case. Of course, this isn’t to say that the top consumer electronics accessories designers haven’t sought to part ways with Apple’s own iPad case design and put forth something completely new and unique. However, in many of the new models making their way to the marketplace, it is becoming more and more apparent that designing cases for the iPad has proven elusive for many of the top design companies — which is why many of them have opted to play it safe and stick to Apple’s own iPad case template. far as I’m concerned, it is a design like this that can effectively dissuade you from using our iPad on a regular basis. But perhaps one of the most compelling iPad case designs comes from Hong Kong’s Uniea brand, which used a retread of one of its laptop cases as a starting point for its first iPad case offering. And interestingly enough, Uniea’s Omniverse iPad case shares some of Apple’s features while offering premium protection and versatility that you just don’t get from these other cases. Uniea’s Omniverse iPad case is a combination tote and sleeve that features the same front flap design that is seen on Apple’s iPad case. But instead of it being a stiff flap, the Omniverse’s front flap is soft and pliable, featuring the same memory foam cushioning that surrounds the entire case. This memory foam technology, together with corner stabilizers, offers what I believe to be an industry-leading level of protection while still providing the same level of easy access as we see with other folio-style iPad cases. There are similar designs on the iPad case market that mimic the Omniverse. 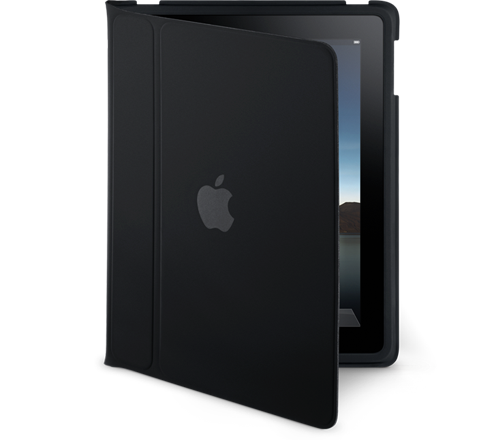 For example, Targus’ Crave Slipcase at first glance looks like an exact replica of Uniea’s Omniverse iPad case. However, upon closer inspection, we see that, while the Crave sleeve shares the same stowable tote handles and similar design motifs, it does not offer the memory foam protection like the Uniea iPad case, nor can it be fully zipped open for access to the iPad. Even though Apple is most definitely the leading creator of innovative consumer electronics in the world today, that doesn’t mean that the cases they offer for their gadgets offer the most protective and useful designs. Therefore, simply purchasing an iPad case that copies Apple’s own case design will not necessarily give you the features, versatility, and protection you’re looking for. My advice is to focus on a case that really puts protection and accessibility at the forefront of their design, and isn’t afraid to depart from Apple’s own design templates when necessary. I agree. We’d go for 3rd-party cases other than Apple’s own case. « New Louis Vuitton iPad Case Begs the Question: Is the iPad a Status Symbol?